Which Credit Card Will Maximize My Miles? I just found your site, and will become a regular! Good info! A question that I hope is simple: We rarely use credit cards (in principle, having been badly bitten 10 years ago), but we are buying a house and about to spend many dollars on big-ticket things (fridge, stove, furnace…). What’s the best mileage-producing Visa card that we could get, in order to get miles for these big-ticket purchases? We like flying JetBlue, but we won’t do American Express. Is there a Visa card that JetBlue will accept for miles? We have about had it with United, but the United Visa card is the one everyone points at. Or is that just because I used to be a 100K United flyer, and am still using up their points? 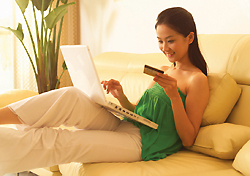 You’re right to be looking for some kind of reward or rebate for your upcoming purchases. Since the dollar amounts will be significant, it’s not an opportunity to be squandered. First, let’s step back and consider an option you didn’t mention. Question: Are you absolutely committed to taking your reward in the form of frequent flyer miles? If not, most of the larger credit card issuers offer cash-back cards that typically feature a 1 percent cash rebate for most purchases, and even heftier rebates for selected categories. For example, both the Bank of America Cash Rewards Visa and the Chase Freedom Visa cards come with no annual fee, a 1 percent cash rebate on most purchases, and higher rebates for various categories of merchandise. The Chase card, for instance, will be offering a 5 percent rebate on up to $1,500 spent on home improvement and home furnishings between April and June of next year. There is no non-American Express option for earning points in JetBlue’s program, but cards such as the Citi ThankYou Preferred card or the Miles by Discover card award miles that can be used for flights on any airline. Cards in that category – which have come to be known as flex awards cards – also benefit from their lack of blackout dates or capacity controls. Finally, the United Mileage Plus Visa card is a solid choice, provided – and this is true for any program-linked card – that United’s program works for you overall. The card’s $95 annual fee is waived for the first year. And there’s a 30,000-mile bonus after charging the first $250 to the card. And perhaps of particular relevance to your situation, you can earn two miles for every dollar spent at “retail locations that classify their merchant locations for Visa as a home supply store,” although purchases at superstores, warehouse clubs, and discount stores are excluded from the bonus. So if you can work around that restriction, you can earn double United miles for your appliance purchases.